As the nation, and to an extent, the world, paused Sunday to reflect on the September 11th attacks, I was having mixed feelings. Don’t get me wrong. I, too, mourn the loss of over 3,000 innocent lives that were cut short by the cowards that hit us ten years ago. But I know that the media can over-hype even solemn occasions to the point where they become just another story du jour. In 1986, a very good friend of mine took me sightseeing around New York. We stopped at the World Trade Center and went up to the observation platform at the top. It still gives me an eerie feeling to realize those towers on which I once stood were destroyed intentionally by enemies of this country. The pictures from that day now have so much more meaning. On that Tuesday morning 10 years ago, I was in Culver City and saw the photos of the smoking towers on the Internet. At first, like many, I thought it was a trailer for a new Hollywood action film. But when a collegue rushed in and asked if I had seen it, then explained what had happened, I was stunned. I listened to the news the rest of the day, hoping that somehow a newscaster would say something to help me make sense of what was happening. The weekend-long event was a moving tribute. Law enforcement, emergency medical personnel, and military were there. Terry Revella, former New York law enforcement official in various fields, is one of the organizers. That day, Revella, still on the force back then, heard the report of the first plane hitting the World Trade Center and drove over to help. He says he was on the ground for no more than a minute before one of the towers fell. By the grace of God his life was spared. He described what went through his mind as he listened to the deafening sound of the tower collapsing around him. On Friday they had the opening ceremonies to the 3-day observance. Mimi Sledge, singer in the Sledge Grits Band, belted out a rendition of The Star Spangled Banner that set the tone for the weekend-long event. She followed that by singing Lee Greenwood’s “God Bless the USA”. Personally, I doubt anyone who heard Mimi on Friday will ever forget this event. 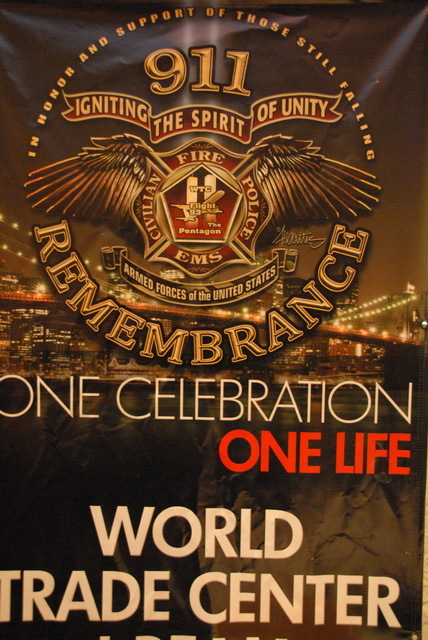 Igniting the Spirit of Unity was the theme for the remembrance. The spirit of unity we all had in the days and weeks and months after we were attacked. Revella talked about how not only law enforcement and emergency personnel were running into the buildings to help save people, but even the “hot dog vendors, and homeless” helped. Many people have since succumbed to illness caused by breathing in the asbestos-laden dust from the collapsed towers. Remember, asbestos was commonly used in building materials during the late 60’s early 70’s when the towers were constructed. During the remembrance event, they talked about the search dogs. One search dog, Porkchop, was at the event. Normally the media reports that search dogs are being used for rescue and recovery efforts, but nothing is ever said about them after their job is finished. Out of over 300 dogs on the job back then, only 25 are left. A lot of them died from inhaling toxic chemicals in the dust. One thing that struck me about this event was how candid everyone was when they spoke. I learned things the media would never report. I listened in awe as the speakers shared their stories, most of them survivors of that terrible day. Remembering what happened on September 11, 2001. Honoring those perished in the attacks themselves, and the 1,000 more who have died since. Saluting those who have risked and given their lives in service to our country. Encouraging our nation to get back to the spirit of unity our nation had back then. This is what the organizers were trying to bring back. And I think they succeeded.